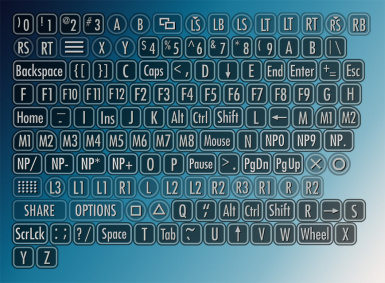 Toggle HUD elements on or off, scale sizes, change positions and swap elements with alternative version. 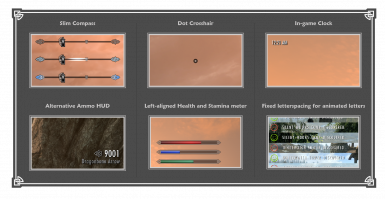 Features dot crosshair, slim compass, alternate ammo display, detached compass markers and built-in support for font mods. 5760 x 1080 or 1440 x 7680 Surround Triple Monitor Gaming for SkyUi 5.2 if not used some menu elements will not be properly placed, though it will still be usable. 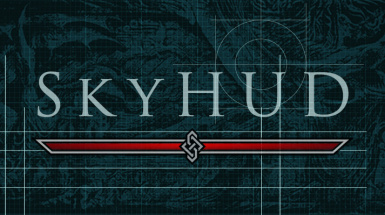 You're free to share your preset (skyhud.txt) anywhere. 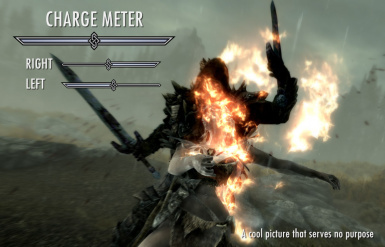 The rest of the mod must not be included and you must state clearly what version of the mod your preset is for. If I happen to totally vanish from online world for a period of at least two years, consider this mod abandoned and available for the public to do as they see fit. I can be reached on Reddit as /u/Fhaarkas. 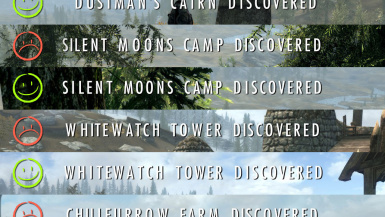 * Update buttons to match Skyrim SE and then some. Some buttons are recreated and looks better than SE! * Separate binary and presets installation. The main download still has presets that can be installed manually. 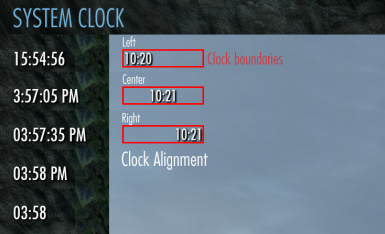 * Fix for crosshair glitching when switching between normal and alert mode. I have a penchant for going missing for months or even years on end. As such, please do not rely on me for support. Any request is also unlikely to be heard. You have to solve any compatibility issue on your own as I simply do not have the capacity to help you. You will find support among fellow users, please treat each other well. For common issues and questions, please refer to the stickied post. 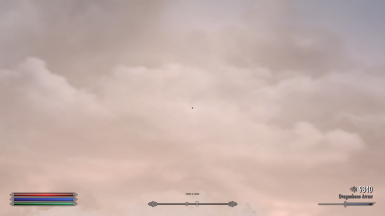 Customization is done by editing skyhud.txt file located in “%SkyrimSE%\Data\Interface\skyhud” folder. 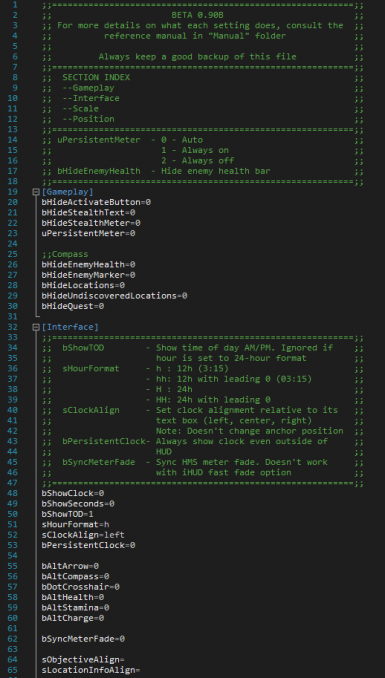 The config file is formatted to be similar with Skyrim’s INI files like Skyrim.ini and SkyrimPrefs.ini. For a list of possible configurations consult the included reference manual and see [CONFIGURATION CHART] section. I'm a bit too lazy to update the manual so be sure to consult the patch note for undocumented settings as well. WARNING: If you choose “None” for preset, remember no config will be installed! This notice supersedes the installer text for this option, which was erroneously explained in FOMOD. ALWAYS UPGRADE FOLLOWING THIS INSTRUCTIONS. I DO NOT CARE HOW ADVANCED YOUR MOD MANAGERS ARE. 4. Transfer your settings from your backup config file into SKYHUD.TXT in SKYHUD folder. Please read the sticky FAQs and Troubleshooting comment before submitting any support question. Reference manual can be found on the download page. 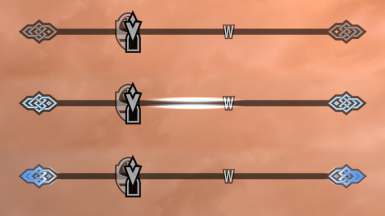 This is a list of UI mods that I can personally recommend. Note that they are not necessarily compatible with each other. If I happen to totally vanish from online world (unreachable) for a period of at least two years, consider this mod abandoned and available for the public to do as they see fit. I can be otherwise reached on Reddit (u/Fhaarkas).